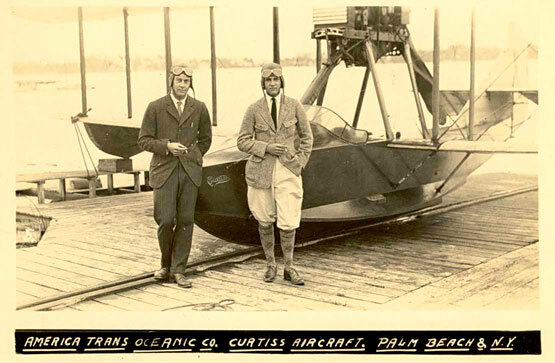 With Palm Beach’s North End as a backdrop, these fashionable pilots pose for a puff with their Curtiss seaplane. From a hangar on the lakeside shore, Rodman Wanamaker’s company offered Palm Beachers same-day round-trip flights from their backyard to Havana, Miami, Key West and Florida’s West Coast. Courtesy of the Historical Society of Palm Beach County. Late in the fall of 2009, a friend and I were motoring to Ithaca for the festivities at Cornell surrounding the dedication and DNA ribbon cutting of Weill Hall designed by Richard Meier, when my friend suggested we stop at the Glenn H. Curtiss Museum in Hammondsport, NY, on Lake Keuka. I hesitated, admittedly not knowing a byte about Glenn Curtiss. Fortunately, my friend insisted, and the museum visit introduced me to the “Father of the American Aircraft Industry” and the pivotal role Curtiss played, in partnership with Rodman Wanamaker, bringing aeronautics to the shores of Palm Beach, as well as later, when Curtiss became one of South Florida’s most influential developers. Too often, Palm Beach’s history of fabled fortunes, enormous mansions and giddy parties overshadows a more significant past, when islanders were part of a greater cultural vanguard. Before World War I, and the decade following, Palm Beach was at the forefront of commercial aviation development as a result of the engineering ingenuity of Glenn Hammond Curtiss (1878-1930) and the pioneering vision and largesse of Rodman Wanamaker (1863-1928). In response to the Wright Brothers ongoing covert aeronautical research, Alexander Graham Bell formed the Aerial Experiment Association (AEA) in 1907, a joint US-Canadian endeavor to design and build commercially-feasible aircraft, with Glenn Curtiss, as director of experiments, and John A. D. McCurdy, a renowned Canadian aeronaut, among them. Within months, the AEA’s five-man group achieved the first officially-recorded public flight in Hammondsport, soon followed by the development of the first seaplane. By 1909, the AEA disbanded as the Curtiss motorcycle shop had become an airplane manufacturing plant, forming the Curtiss Aeroplane Company. Lana Gelb, WHAT IS AGELESS GRACE? Fill out this form and get our monthly newsletter and information about our special events.